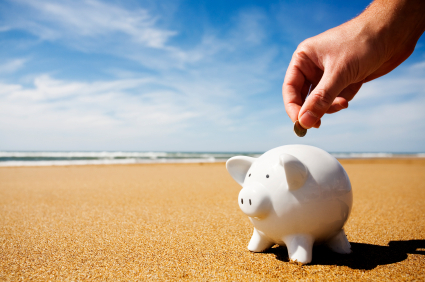 Budgeting and then saving for your vacation sure is not easy. It takes discipline and a plan, but don’t fear we will help you with everything here. Many people just see a low teaser rate vacation offer and don’t dig into the details. This can throw off your vacation budget if you are not careful. Be sure to take into account all aspects of your vacation. Transportation – This could be gas for a road trip, a rental car, transfers, subways and taxis, parking fees, tolls and more. All of these add up quickly. So make sure you know what these costs are going to be so you can budget for them. Tipping – I use to work as a bellman and valet and lived off of the tips I made for many years. It’s not easy and most people you are going to encounter on your travels work and provide for their families 90-100% on the tips they receive for good service. You don’t have to estimate every tip that you will give out, but you should have a ball park idea. If you are taking a cruise the Tipping is automatically added to your stateroom folio now on most cruise lines and you will be paying so much per person per day for your room Stuart, head waiter, waiter, and assistant waiter. You also might tip a tour guide for a great tour, your cab driver, baggage handlers, valets, and servers on your travels. Meals and Entertainment – Set a budget for what you plan on spending on your meals, snacks and entertainment. Meals don’t have to be expensive. A box of cereal and some fruit can make a quick and easy breakfast for everyone. Bring snacks and drinks with you each day during your vacation adventures also cuts down on paying tourist prices for sodas and a quick bite. Of course every meal does not need to be a budget saver. Plan some nice dining experiences and just add them into your overall vacation budget. The same thing goes for entertainment. Look at excursions and if possible book them prior to travel to save money. If you are taking a cruise you can book excursions at the concierge desk on your ship, but they are easily 25% to 75% more than if you book them online or if you book them yourself once you are at the port. If you are new to the area, take a general city tour to learn more then book some activities from what you have learned. So let’s talk about Saving Money for your Vacation. It can seem like an impossible task to save $1,000 or $5,000 or even more for a vacation. But if you take it step by step you will be there before you know it. 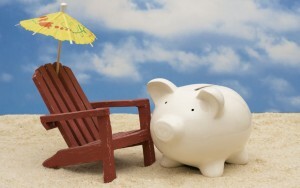 I want to share some money saving tips with you to help you take that vacation of a life time. It’s all about priorities. I had a friend that would fly to almost every football game that his favorite team played in. The cost of the flights, hotels, food and the extremely expensive football tickets I just could not fathom. But football was his thing that he loved more than anything and he made it his priority. He would bring his lunch to work, and limit his expenses and other entertainment so he could participate in the type of travel he wanted. So setting your priorities and sticking with it to obtain your vacation goal is key. Limit your living expenses. It’s not rocket science but living within or below your means allows you to save and take that vacation you are planning for. So if you get a $4 specialty coffee every morning for five days a week, that’s $1,040 a year just in coffee. You can take that savings and put that instantly towards your vacation. Take a look at your cable bill. Could you drop cable TV all together and get an antenna for local stations or Hulu for $7 a month? With the internet you can get movies and most television programs now right on your TV, tablet or computer. Look at lowering your cellphone bill. Use Straight Talk for about $45 a month and no contract. You can by the prepaid monthly plan at WalMart and then just add another month of calls, text, and data for just $45. Do you have a home telephone? Why? Just use your cellphone as your home number and save. There are maybe ways to budget and save money too. Couponing is an amazing way to cut your grocery bill. We would save easily 50 – 80% off of our grocery bill when we would aggressively coupon. Look at websites like http://www.southernsavers.com/ and http://www.couponmom.com/ Buy two or more Sunday papers each week and then look at the deals each week on these coupon sites. They will tell you how to combine coupons to get things absolutely for free or at amazing discounts. There are some fun ways to save for your vacation that will add up quickly. 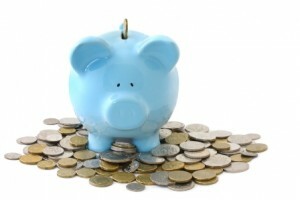 The first savings strategy is to save any bills or change you get that is smaller than a $5 bill. So if you buy a snack with a $10 for example and get $7.89 back in change, you would take $2.89 and place it in your vacation savings jar. With this strategy all $1 and change goes into your vacation fund. A great way to live within your budget is an idea that I heard David Ramsey talk about on his radio show. After you determine your household budget you create an envelope for each expense category. So you would create a grocery envelope, a gas envelope, an entertainment envelope, clothing and on. Then when you cash your paycheck or get your money for that pay period at the bank, you take that money and place the amount for that month or pay period into the appropriate envelope. So if your budget is $50 for entertainment a month, you would place $50 into that envelope. When you go to pay for something you now use the correct envelope to pay. You don’t use credit cards and when that $50 for entertainment is gone, it’s gone until the next month when you do it all over again. This is an easy way to see where your money is going each month and also by using only cash it is more painful to buy things. It’s much more difficult to spend $50 on something when you are paying with cash instead of just charging it on a credit card. So this budgeting method is a great way to reduce your spending and also to discipline yourself so you can reach your vacation budget goal. Also check out Dave’s Budget tools for free. This is a simple and very effect savings technique. If you can get direct deposit for your paycheck have it setup to put a certain amount each pay period into a saving account. This way you never see or touch that money. The money goes right from your paycheck into the savings account you have setup and you are less likely to spend it and forced to live within your means. Before you know it you can save a nice amount for a vacation. Do you have creative ways you have saved for your vacation? I would love to hear about how you saved for your last trip and so would everyone here in the community. 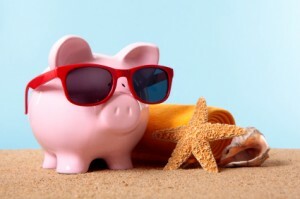 Please share your vacation savings tips by leaving a comment.